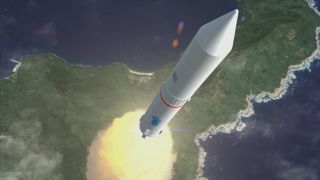 Artist's conception of JAXA's Epsilon rocket during launch. Japan has an extra-smart rocket cued up at the launch pad for a ride into space. The country's space agency plans to fire its first unmanned Epsilon rocket into orbit on Tuesday (Aug. 27) to demonstrate it is possible for a rocket to do its own health checks using artificial intelligence. You can watch the Epsilon rocket launch live online via JAXA webcast streams. Japan's Epsilon rocket, due to make its first test flight Aug. 27, 2013, is equipped with artificial intelligence to perform its own health checks before and during launch. "This became possible by introducing an automatic and autonomous checking system and reducing hazardous operations as much as possible so that dramatic electricity and manpower savings have been achieved," Yasuhiro Morita, Epsilon's launch vehicle project manager, said in a statement. He also vaguely hinted at taking even less time to launch rockets: "We still have some room to additionally decrease the campaign period significantly with further improvements," Morita said. Japan has been launching solid-fuel rockets since 1955, first into the upper atmosphere and eventually reaching for space. In the ensuing decades, the ground for launch services has greatly shifted. Miniaturization and more powerful computers are allowing for smaller and smaller satellites. This makes rocket launches cheaper, since there is less mass to bring into orbit, requiring less fuel. Launch costs are still a major drag on satellite budgets, however. That's where JAXA hopes Epsilon will shine. Epsilon is a three-stage solid-fuel rocket that builds on existing Japanese rocket technology: an H-IIA solid rocket booster in the first stage, and two upper stages based on those used in the discontinued M-V launch vehicle. Unlike previous upper stages, however, Epsilon will be able to run many of its own status checks, which will save a lot of time and effort for the people normally required to monitor a rocket's health, JAXA officials said. "You may doubt that artificial intelligence can be used in a rocket, but nowadays a self-inspection function is something commonly seen in machinery," Morito stated. "Another example is a medical device such as the electrocardiograph, which uses artificial intelligence to diagnose heart abnormalities." While Epsilon itself will have extra smarts, JAXA is also aiming to get the rocket off the pad faster than a conventional one. Rocket assembly will be streamlined so that Epsilon can be taken to the pad with most major components put together, rather than doing it on site. Once the first stage arrives at the launch site, the rest of the rocket can be put together in just seven days, JAXA said. This makes it among the most quickly constructed rockets in the world, JAXA said, and represents a marked improvement over M-V's construction time of 42 days. JAXA is also trying to push down the weight of the rocket even further, through methods such as selecting a tougher carbon fiber for the propellant case. The newer case weighs less than previous versions, cutting down on the need for fuel. Epsilon's first flight is expected to cost $38.5 million (3.8 billion yen) – almost half the $76 million (7.5 billion yen) cost for M-V, JAXA officials stated. Epsilon won't ride into orbit alone. On board will be a small science satellite, the Spectroscopic Planet Observatory for Recognition of Interaction of Atmosphere (SPRINT-A). The tiny telescope aims to peer at Venus, Mars and Jupiter and other planets to see how quickly their atmospheres bleed into outer space. With that data in hand, scientists hope to better understand how Earth's atmosphere behaved when our planet was young.